The 1968-69 Ingraham Rams were undefeated state champs. It's a team often overlooked when the state's best teams are discussed, but they deserve a spot in the conversation. Coach Walt Milroy saw it coming. His 1967-68 Ingraham High boys basketball team had gone 15-6 but missed the state tournament. Milroy knew much better things were in store the following season. If the pressure of the bold prediction made the journey to a state title hard for him to enjoy, it was nothing compared with the pressure the Rams put on their foes. Full-court pressure. Every second of every game. Fifty years later, Ingraham is enjoying a boys-basketball resurgence and has a chance to break a long (1975) drought of not making it to state in the coming weeks. Members of the 1968-69 team remember their season as if was yesterday. The Rams were led by eight seniors who were all good. Collectively they were great. Normally they overwhelmed foes. When they didn’t, they showed the grit and resilience that elite teams possess. The team is overlooked in the conversation of the state’s best ever, but Inslee thinks the team deserves at least one award. Milroy was the youngest of five children, raised by his mother after his father died suddenly and unexpectedly when Walt was 1. 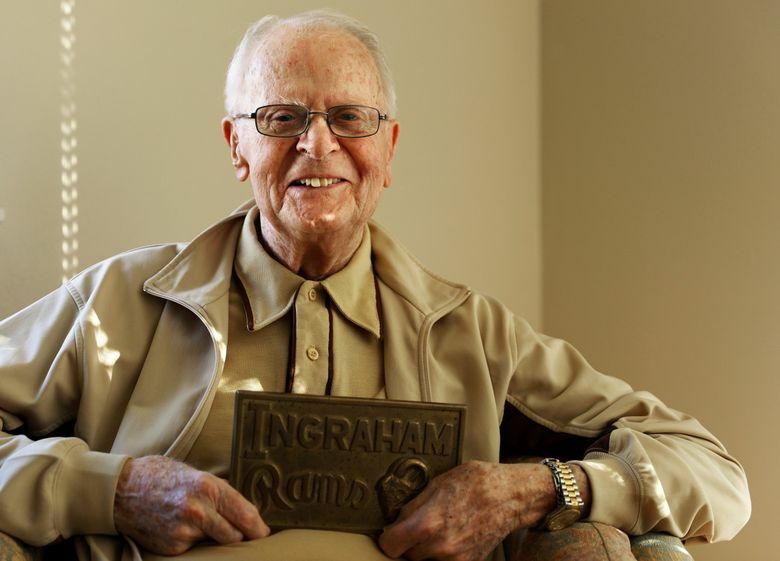 He was playing baseball and JV basketball at the University of Washington when the Japanese bombed Pearl Harbor in 1941. Milroy joined the Navy, returned to UW after the war and captained the Husky baseball team in 1946. He landed a teaching job at Seattle’s Queen Anne High School, coaching baseball and sophomore basketball for 12 years. When Ingraham opened in North Seattle in 1959, Milroy was thrilled because he lived a half-block from the new school. The job of baseball coach was spoken for, but Milroy became the basketball coach. “I would have taken a job as the janitor,” he said. Milroy’s first Ingraham team was 0-14. Two years later he guided the Rams to the state tournament. In 1964, Milroy brought back the 2-2-1 full-court zone press he had used coaching the sophomore team at Queen Anne. “I used it when I had the right people — when I had quickness, with guards especially, and depth,” Milroy said. Exactly what he had on the 1968-69 team. Unlike most successful Seattle high-school teams today, the Ingraham players were all from the same neighborhood. “We grew up winning all the championships, with the parks and AAU and all of that,” said Steve Merkley, who led Ingraham in scoring. The top eight rarely played in the fourth quarter because Ingraham would be so far ahead and Milroy didn’t want to run up the score. He often couldn’t help it. The starting guards, the first line in the 2-2-1 press, were Merkley, considered the best athlete on the team, and Randy Leeland. They had quick hands, quick feet and were constantly attacking. Brown, the tallest player at 6 feet 6, and Reed rotated at center and protected the basket. The starting wings most of the season were Ed Kamins, considered the best shooter, and Mike Kroeger, built like a fullback. 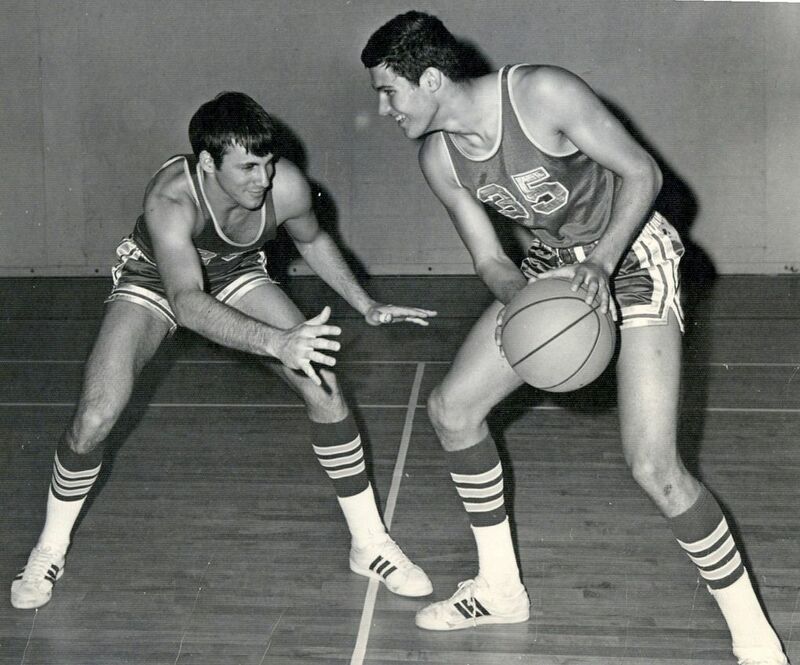 Steve Waite, who played multiple positions, and Inslee, who had played varsity since he was a sophomore and excelled on defense, were usually on the court at end of close games. All eight could score, averaging between 6.6 and 14.4 points per game. Some players dispute Milroy’s description of their shooting. No one denies the defense terrorized opponents. “He loves competition. You can just sense it. He didn’t mind people being aggressive. I shouldn’t tell this story, but I will: I remember one time there was a little altercation between two of our players, (and) there were some tempers. We still tell this story, but I think Walt kind of enjoyed watching it, rather than breaking it up. Let that aggression work a little bit. So he’s super thrilled about competition. “I am very appreciative of his leadership and his friendship over the years, and to see him still being such a fervent member of our community. I will tell you another thing about Coach Milroy. I had no idea about Coach Milroy’s policy beliefs or political beliefs. If you were to ask me in 1985, what Coach Milroy’s policy beliefs or politics were, I would have absolutely had no idea. “What really stood out for me was our practices were real competitive and we fought against each other every practice. … By the time we got to game time, it was a piece of cake because we were ready to play and we always had somebody that was going to be on that night. The Rams trampled almost every opponent through the first 15 games of the season, averaging 83.3 points and allowing an average of 54.5. 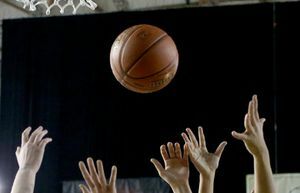 The goal was to score at least 80 and hold opponents under 40. The Rams beat Shorecrest 101-39, Shoreline 97-47 and Cleveland 97-49. 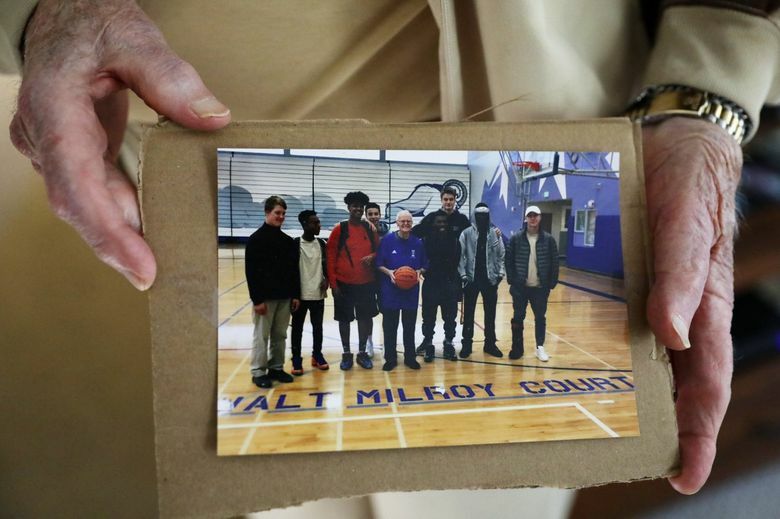 Before playing West Seattle, Milroy had a message for his team. “I really wonder if that conversation occurred,” Reed said. After steals, they scored as quickly as possible. It didn’t matter who. “If he had let us play the whole game, we would have every Metro League scoring record,” Waite said. It seemed no one could stop the Rams, except maybe themselves. A night in mid-February, after Ingraham won its 15th game, Milroy was meeting with players’ parents when the police called: Merkley and Brown had been caught with beer. Brown said at first he didn’t think much of it. 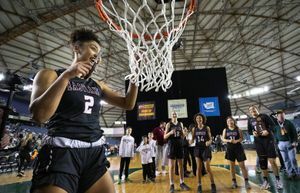 “But the next day we’re driving to school and (we) hear on (the radio) that two Ingraham players had broken training rules and were going to be suspended,” Brown said. Brown was initially defiant. He was almost 18, and kids his age were leaving after high school to fight in the Vietnam War. He thought he should be able to drink a beer or two. But after a day to ponder it, he said he realized his attitude was selfish. It was signed by Brown and Merkley. The two watched as Ingraham beat Roosevelt 44-43, the same team the Rams had beaten 83-51 two games before. Meanwhile, the other players met with Milroy. “The ballplayers said, ‘That’s punishment enough,’ ” Milroy said. The suspension ended. The winning continued. Ingraham was the team to beat in the 16-team event, with a 19-0 record after rallying from a 24-15 halftime deficit to beat Garfield for the Metro League title. 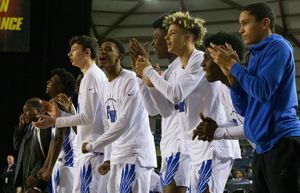 The Rams were in a more precarious situation in the state tournament opener against Renton. The Rams, according to Milroy and a couple players, trailed by about 10 points with three minutes left. What is documented is Renton led by three points with 49 seconds left and was shooting a one-and-one free throw. Most Ingraham players said it never occurred to them they might lose. Leeland was much less confident. Renton missed the free throw. Reed made a free throw to cut the deficit to two, and Kroeger had a tip-in to send the game into overtime, which the Rams dominated, winning 61-51. Ingraham defeated Glacier and University in the next two rounds. In the title game March 22, the Rams faced Hoquiam, led by the 6-7 Quigg brothers, John and Pat. John later played for UW. Neither team did, as both struggled to score. Reed scored two late baskets and give Ingraham a 39-38 lead with about 10 seconds left. Hoquiam had the ball under its basket. Reed, the last line of defense in the full-court press, read Hoquiam’s play before it happened. He envisioned two passes to half-court, then one of the guards getting the ball on the side. Reed blocked the shot with his elbow, knocking the ball into the stands. Inslee had never seen Reed jump like that. A couple of seconds were left. Milroy brought in the 6-6 Brown to disrupt the inbound passer. A wayward pass was intercepted by Inslee, and a second later the Rams kicked off a wild celebration. “It was heaven,” Kroeger said. After the title, the Rams went to the State Capitol to be honored by the Legislature. 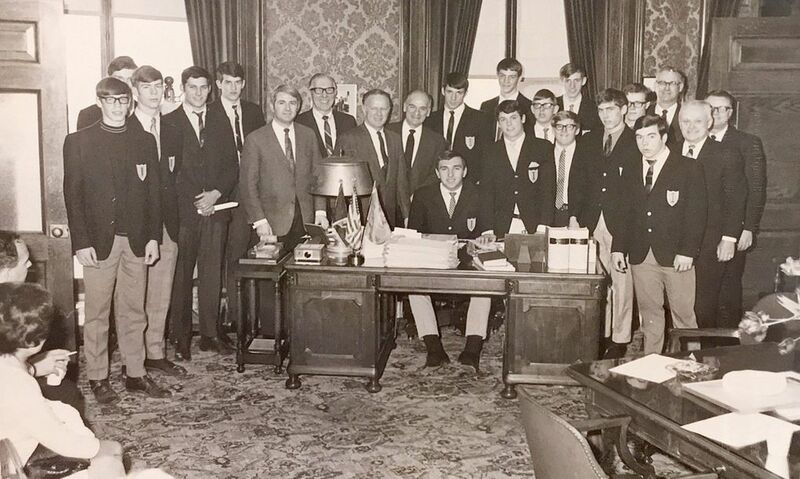 Nearly 50 years later, Inslee is reminded of that moment during an interview in his office. He moves to a shelf of memorabilia and comes back with a photo of the moment. 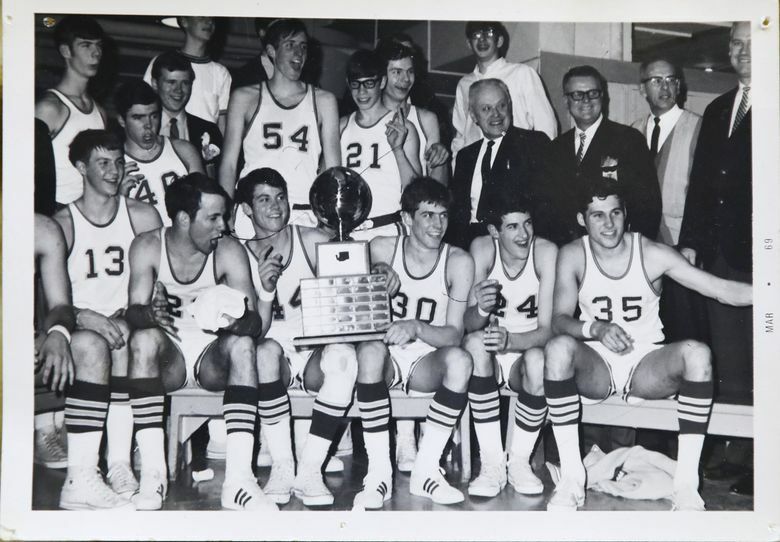 The Ingraham High boys basketball team finished 23-0 in the 1968-69 season. Here is that season’s schedule. The eight leaders all graduated from college and went on to successful careers, as teachers, lawyers and businessmen. And one leads the state. Two players have died, including Ed Kamins in 2004 from multiple myeloma, 11 years after his diagnosis when he was given one to five years to live. George Sparling, a reserve senior guard on the team, died last year. 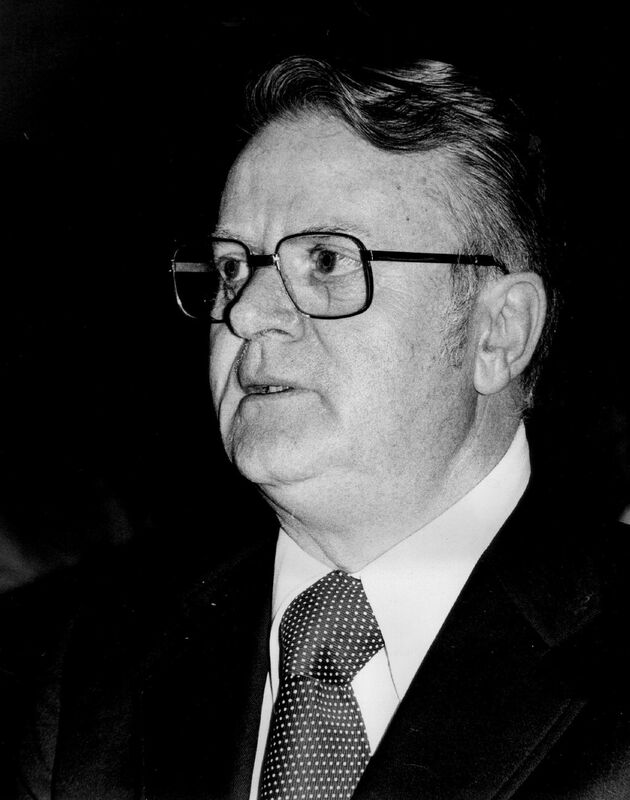 Milroy retired as Ingraham’s coach in 1980. He is like a proud pop when talking about his players, and they still revere him. “He deserves all the accolades and praise a person can receive,” Reed said. 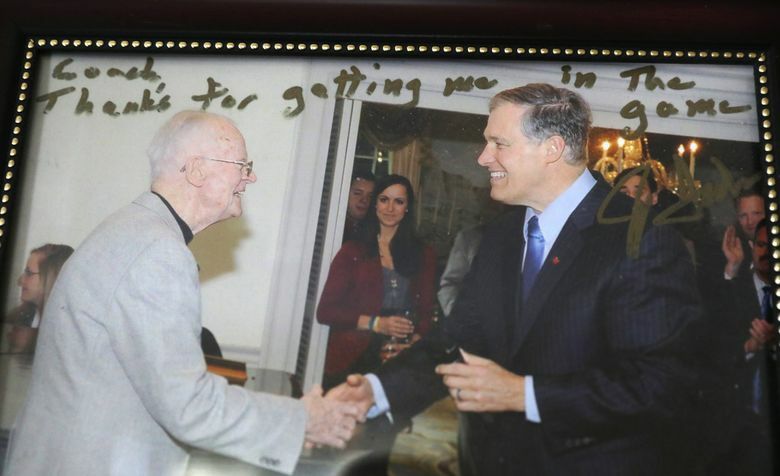 Inslee said he didn’t contemplate going into public service until his late 30s. But his teammates and coach are not surprised by where he landed. Inslee was a U.S. congressman for 13 years before being elected governor in 2012 and re-elected in 2016. 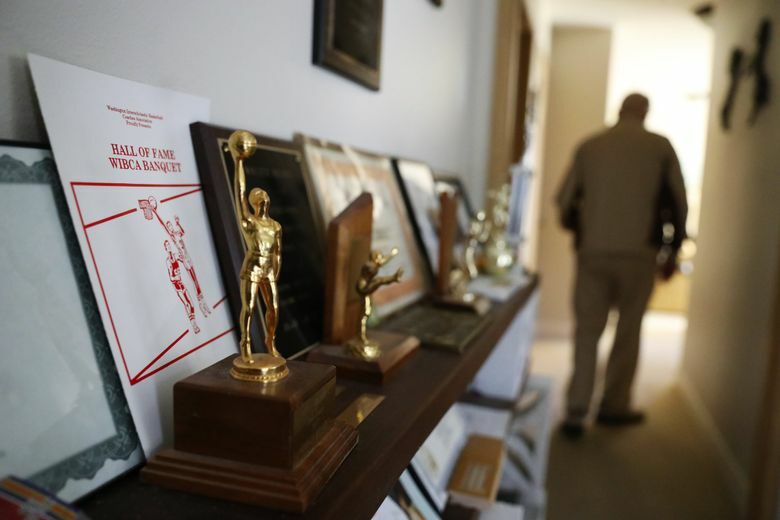 The bond and trust built 50 years ago on the basketball court are appreciated more now. The eight seniors who led the 1968-69 Ingraham High boys basketball team had successful careers, and half are still working full-time. Here is what they did after high school. Chris Brown: Played basketball briefly at Washington State, then at Bellevue College before graduating from Western Washington. Taught special education students for decades, and still teaches part-time. 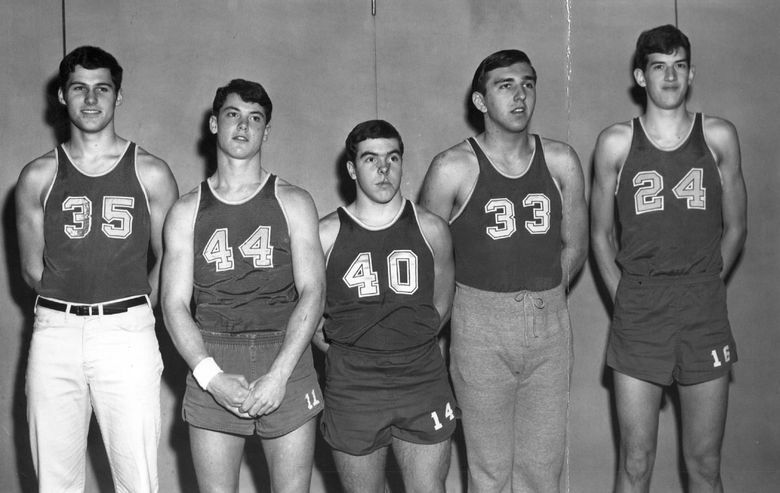 Jay Inslee: Played freshman basketball at Stanford before transferring to UW. As a U.S. representative, he was a star on the legislators’ basketball team, and has a picture in his office of him playing basketball with President Barack Obama at the White House. Ed Kamins: Graduated from UW with a degree in civil engineering and became a contractor. Here is the roster for the 1968-69 Ingraham Rams submitted for the state tournament program (in alphabetical order). Stats are from the regular season. Mike Kroeger: Spent a year in the Coast Guard Academy before graduating from UW and had a long career in the banking business. Randy Leeland: Had a stellar basketball career at Pacific Lutheran before going to law school. He is still practicing law full time in Yakima. Steve Merkley: Went to WSU on a basketball scholarship, then switched to baseball after a coaching change. Became a teacher and baseball coach, and works full-time at Kamiak High School in Mukilteo. Ricke Reed: Played basketball at Bellevue College and Lower Columbia College, then two years at Seattle U. He became a teacher and works full-time at a Sedro-Woolley middle school, while also teaching a class at Sedro-Woolley High and two nights a week at Skagit Valley College. Steve Waite: Played baseball and basketball at Lower Columbia before playing baseball at Gonzaga. Taught three years at a middle school before becoming a manufacturing engineer and corporate instructor.